I got a request from several people to start a “baking tips” series on this blog. And you know what? That sounds like a fabulous idea! While I’m a self taught baker and I would never recommend you taking my word as the end all be all, I would love to share my personal tips and tricks with the hope that someone will benefit from it. 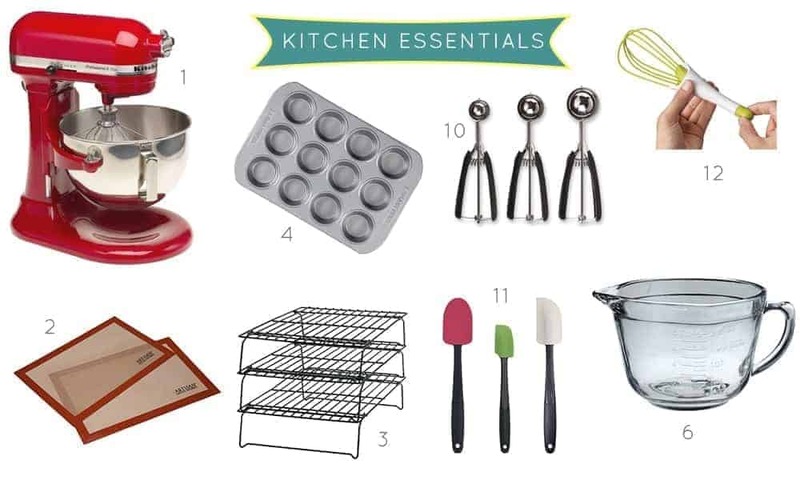 So the first post in what I’m calling the (stress)Baking Tips series is my personal Kitchen Essentials. A little background on me: I’m a frugal person. 75% out of necessity, and 25% because I just hate the idea of wasting money. Paying $200 for a pair of jeans, or spending $50 at a bar every night isn’t how I roll. I eat what’s in the house until I get down to the last morsel, and consequently end up with some seriously weird meals leading up to that point – like 10 strands of spaghetti with 1 tablespoon of butter and a side of 6 pita chips. I’ll duct tape things until the duct tape can no longer solve my problem because it’s turned into a safety hazard. With that said, there are certain things I just can’t function without in the kitchen and I wanted to share my list with you. Maybe this will help you out if you’re just getting started in baking, looking to expand your arsenal, or even looking for gift ideas for a baker that’s close to your heart! I have a couple sets of the Artisan brand and I use them constantly. They’re perfect for baking things like cookies, macarons, meringues, scones, etc., but I also use them as my surface to roll out dough. It’s a great idea to have a bunch of these so that when you’re baking things in batches – you’re able to prep the next round to go in the oven on a room temperature mat, rather than wait for the previous batch to cool enough to move them off the mat, wait for the mat itself to cool, clean it off, and THEN add the next batch. It’ll save you a ton of time! I can’t emphasize enough how amazing it has been to use these 3-tier cooling racks. I have a small kitchen with practically no counter space, so being able to stack them on top of each other has been huge for me! Of course, you could choose not to stack them, but what’s the fun in that when you could have a cookie tower?! I have two of these, and one in a large size that holds six large cupcakes/muffins for those days when I just want a gigantic blueberry muffin. Because let’s be honest – sometimes you just need a gigantic muffin. I have approximately 572485723 baking sheets, but I think these AirBake baking sheets are my favorite. I find that everything bakes evenly, it hasn’t stained, and it might even reduce the baking time on some of my recipes – which is great, as long as you plan for it and don’t let things overbake! To paraphrase Spiderman, everybody should get one. You truly need it to make certain things, like angel food cake and proofing yeast for bread dough. It’s definitely heavier than any other type of bowl, but it’s totally worth it. I don’t have it yet, but I have my eye on this Anchor glass batter bowl with a handle. A handle! I have a crazy mishmash of bowls in my kitchen, and I very much would like to consolidate and get a matching set, and this OXO Good Grips 3-Piece Mixing Bowl Set is one that I have my eyes on. This is another kitchen essential that I have a mishmash of – some are functional like these OXO measuring cups, but others I’ve collected over the years because they’re completely adorable (like this set I got at Home Goods a couple years ago). Surprisingly, I only have one set of these. Look at me, being practical! I like the clean look of all metal spoons, but that’s another personal preference. Plastic or ceramic will work just as well! The ones I have are super cheap and half-broken, so I’ve got my eyes on these OXO bad boys for a day in the future when I’m willing to splurge. I have a super soft spot for silicon spatulas. They’re useful for so many things, and having the heat-proof kind is a constant life saver. I have this OXO Silicone Spatula Set and the different sizes are perfect to scrap out bowls of dough. I also have this Wilton Easy-Flex set and they’re great for those times you need a spatula that’s not quite as rigid (runnier batters, particularly) – I find myself using the largest one to press dough into pans because if I coat it in a little non-stick spray, it’s the perfect size and flexibility to help me even out the mixture. You want to have at least one small whisk and one large whisk. Small whisks come in really handy for quickly whipping an egg white, or something similarly small in volume. I absolutely love this 2-in-1 balloon and flat whisk. It’s magical. You just twist it to expand it into a balloon whisk, and back again for a flat whisk. It’s super easy to clean, and it’s silicon (which clearly, I’m a fan of) so you can even use it over heat. This is quite possibly my favorite kitchen utensil. If you can afford to get the nice reusable kind, go for it. But for me, it’s easier and makes more sense for me to use these plastic disposable ones. When I’m working on a recipe that needs four different kinds and/or colors of frosting, having the ability to yank four bags out of the box and have them ready to go all at the same time. I have this exact set and I am in love with it. It has any and every tip you could possibly think of with a cute little carrier to keep them all! I will say that if you jostle the box around, the tips can fall over and get kind of scrambled, but if you’re just moving it from a shelf to a counter to pull them out and put them away, it’s not a huge concern. I very much prefer gel paste food coloring to any other kind – it’s more concentrated, which means you don’t need to use as much and it doesn’t dilute what you’re adding it to. They take a little getting used to, but it’s worth it in the long run. I always use plastic wrap to cover dough overnight. I don’t have a loyalty to any specific brand of plastic wrap, but you want to make sure it’s the kind that clings really well so that you don’t end up with dry dough – nobody wants that! This is another that I don’t have a specific brand loyalty to, but it’s essential for so many purposes. I really like getting the unbleached kind because it’s more “green”, but that’s just a personal preference. Umteenmillion adorable cookie cutters – because who doesn’t love adorably shaped and decorated cookies? I hope this helps you get your (or someone else’s) kitchen collection started! What are your kitchen essentials? Tell me in the comments!